It is absolute joy for me to bring you unique and thoughtful product design to make your life more easier and beautiful. A simple set of wall shelves artistic design, they are not only functional but also decorative. 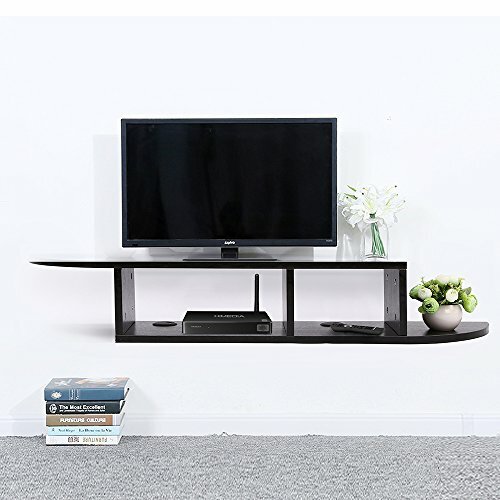 For TV, the TV table is never important in front of wall TV shelf, its design take less space, 2 tier shelf is best for router, set-top box, DVD player, books, remote, projector, vase,picture frames, cable box, game console, TV component and decorations. Sturdy 4 hidden mental brackets improve the storage the max support, can bear the capable of the holding over 70lbs. anti-rust and corrosion-free finished, high grade MDF board, good breath-ability, Eco-friendly and healthy, it's safe for kids in your house, and its important. Safety Round Corner Design, not right angle design, protecting children and the elder from collision and avoid injury. If your cables are messy, don't worry, the TV shelf possesses cable holes, you can manage your cables go through them, cables are neatly concealed, show the profession, and mini look. [WALL TV SHELVES & SAVING SPACE] - Wall mount floating shelf design doesn't take much space, perfect choice for adding additional shelving space, 2 tiers shelves for display & storage, perfect for router, set-top box, DVD player, CDs, remote, projector, knickknack, cable box, game console, TV component and decorations. [TRIANGLE BRACKET & 70LB LOAD-BEARING ] - 4 hidden mental brackets to fix into the wall, give the storage the max support, so that it can bear heavy weight, capable of holding over 70 lbs, to put the DVD player, CDs, and some TV device, and display vases, family pictures and collectibles, which makes your home more luxurious and elegant. [SAFE AND HEATHY WALL STAND] - Sturdy metal bracket with anti-rust and corrosion- free finish, high grade MDF board, good breath-ability, Eco-friendly and healthy. The corner design can effectively prevent the impact of the collision and avoid injury. It's safe for kids in your house. [DIMENSIONS & LONG QUALITY ASSURANCE] - Product size: 38.58''×12.60''×3.94'', G.W. : 13.49 LB. WARMTH NOTICE: If you are not satisfied, before you leave the negative review/feedback, pls. contact us and let me know that, we promised to provide a long quality assurance service to you.